The trawler seems to be in overall good condition and the two diesel engines started right up! One of the engines had been rebuilt, per the seller. The upholstery looks in decent shape. Really nice hardtop! It is unclear if any of the electronics are present or functional. Owner not sure how to operate the vessel. Stock #161861 34' Californian Long Range Trawler powered by twin, 185 HP Perkins DIESEL ENGINES! 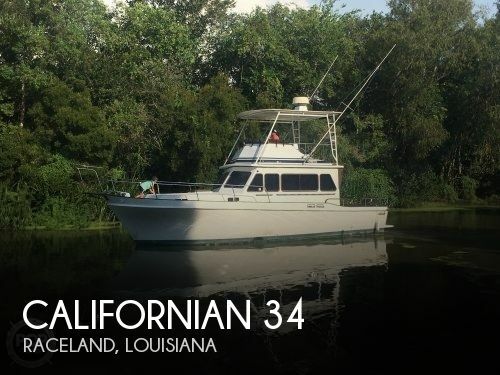 If you are in the market for a trawler, look no further than this 1981 Californian 34 LRC, priced right at $42,800 (offers encouraged). This vessel is located in Raceland, Louisiana and is in good condition. She is also equipped with twin Perkins engines. Reason for selling is seller is not using the boat very much and may be looking for something bigger in the future..